A costly bridge that was recently torn down in East China's Anhui Province has put the spotlight on the ongoing issue of officials wantonly calling off expensive projects and not being held to account for it. Last Tuesday, the Yudai Bridge over Pingtian Lake in Chizhou, Anhui Province, was demolished just as it was nearing completion. The one-year project had cost the local government over 3 million yuan ($460,000), the Beijing News reported. 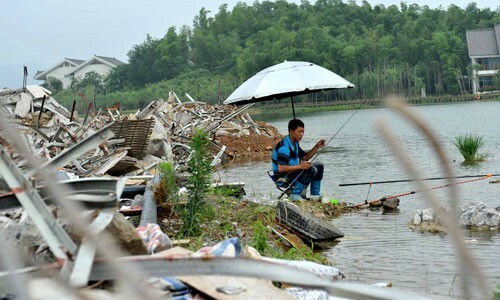 The Pingtian Lake Management Committee told reporters that the bridge was too large and would ruin the beauty of the lake, adding that the construction would also influence water exchange and reduce the lake's self-purification capacity, the report said. In a telephone interview with the Global Times, a press official from Chizhou who asked not to be named only said the bridge was built while the former mayor was in office and then torn down after the new mayor came to power, refusing to provide more details on the assessment process of the project. "It is the taxpayers who eventually pay the huge bill, and as far as I know, nobody at the decision-making level paid anything," Zhu Lijia, a professor with the Beijing-based Chinese Academy of Governance, told the Global Times. Local governments that spend huge amounts of money on short-lived construction projects are not rare in China. Last August, three newly completed buildings in the 40-billion-yuan ($6 billion) Xi'an Daming Palace National Heritage Park were torn down. Zhou Bing, director of the preservation and promotion office of the heritage park, told People's Daily that the move was aimed at helping the Daming Palace Heritage site better meet world cultural heritage demands. It was reported that as a national cultural relic protection unit, the park requires approval from the State Administration of Cultural Heritage before any construction can go ahead. However, none was provided. "The new buildings don't fit with the rest of the heritage site," An Jiayao, a researcher at the Institute of Archaeology of Chinese Academy of Social Sciences told the Shanghai-based National Business Daily. "Certain modern designs could not possibly have appeared in the Tang Dynasty (618-907)." Similarly, in Nanyang, Henan Province, a halt was ordered to the construction of two 27-story residential buildings for low-and medium-income earners last year just as they neared completion. Millions of yuan had been thrown into the twobuildings, and the order to cease construction was reportedly made because the local government wanted to build a press release center in the same location for the Seventh National Farmers' Sports Meeting, which falls in October 2012 in the city, according to the Beijing Times. According to a 2005 report by the National Audit Office on the economic responsibilities of the former leaders of 10 State-owned enterprises, losses in 2004 caused by economic crimes, including bribery and corruption, came to 1.6 billion yuan, while losses caused by bad decision-making was as much as 14.5 billion yuan. Gao Zheng, secretary general of the residential engineering committee of the China Civil Engineering Society, told the Beijing Sci-Tech Report (BSTR) that the lack of strict management in city programming is the main reason why construction projects are suddenly abandoned. "In many places, projects change according to who is in office. Some uncompleted projects launched by the former leader are demolished during the tenure of the new leader," said Gao. "These 'unnatural deaths' of projects are the biggest waste of resources." Zhu Lijia said that some new leaders try to boost their own prestige by denying former leaders' political achievements, giving themselves more chances of promotion. "Raising GDP growth is another main reason," said Chen Zhaoyuan, a member of the Chinese Academy of Engineering. Chen said that large-scale demolition or reconstruction could boost the development of certain industries, including architecture and building materials, which would in turn push GDP growth. "But in the long run, the growth of GDP brought by demolition is not sustainable," Chen was quoted by BSTR as saying. Statistics provided by the World Bank show that between the seventh and ninth five-year plans (1986-2000), waste of funds and economic losses came to between 400 and 500 billion yuan ($62 billion and 77 billion), and as high as 30 percent of those losses were caused by wrong investment decisions, according to Yangcheng Evening News. "These wrong decisions should be reduced to a minimum through the complete participation of organs of State power," Zhu said. He said that without a decision-making system, local governments had too much freedom to make impulsive decisions. "Local planning departments usually propose a certain project to the local government for approval, and the latter directly makes decisions without letting the local People's Congress know," said Zhu.